WCRC would like to celebrate the courage, determination, tenacity and lateral thinking of Susan Pienaar. She is truly an inspiration to both staff and clients, and like so many of our other clients has demonstrated that one can triumph over adversity ! 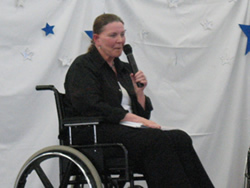 We were honoured to welcome Susan as one of our guest speakers at the WCRC International Day for Persons with Disabilities on 03 December 2007. 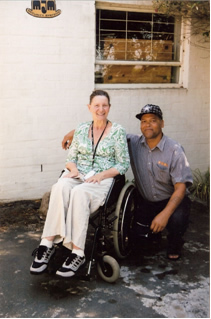 Susan Pienaar was left paralysed due to Guillian-Barre. Her life, as she used to know it, was no more. She was previously an independent woman who ran her own music school from her home in Welgemoed. Due to weakness in her hands, she could no longer play the piano or continue with her livelihood. Medical bills further depleted her financial resources. However, by a strange twist of fate, one of her previous music students, Suzanne Starck, was her Occupational Therapist at WCRC. ‘Agt maande gelede het my gebroke liggaam hier aangekom – totaal verlam en van geen nut vir medemens of self nie; my eie “ek” gestroop van finansiële status deur mediese onkostes, my ego gelykgemaak met medemens….Taxibestuurders, onderwysers, enginieurs, haweloses, ander wat hul tuiste onder brue gehad het, swart, wit, bruin, Christen, Moslem – het snags saam met my gelê en huil, saam met my gebid…en hier in die donker uur het hulle almal my broers en susters geword’. Today Susan uses her recorded music to continue educating children in music. She has employed an assistant (who she has had to teach and train) to assist her with the lessons. Regular therapy has enabled Susan to use a computer and since her rehabilitation, she has written three self published children books, a hidden talent she discovered only after discharge! Susan was also the creative artist responsible for the beautiful illustrations in her books. 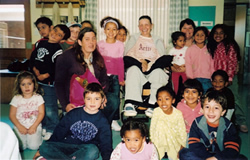 The WCRC is extremely honoured that her book ‘Die Yslike Groot Akker’ is dedicated to WCRC.